The BBS Magazine » Blog Archive » Dude, where’s my Game Corner? The Game Corner was around in the first mainstream games Red, Blue and Yellow. Found in Celedon City, it housed a number of slot machines, all with the same standard game. Match three icons up and win a number of coins, with three lucky 7s giving the best reward. It also had a separate building for claiming prizes. Prizes included TMs like Blizzard, and the famed Porygon, a weak Pokémon. But we weren’t to know that, because it was worth a whopping 9,999 coins! That’s a lot of gambling minigames. Unless you just bought your coins. Then it’s a lot of money. Because of this, Porygon was considered a symbol of achievement. It was the only way to get it, and ever since that infamous episode in Pokémon involving it in Japan, it was never seen in the anime. But that’s not all – the Game Corner even held some plot relevance. Team Rocket had a secret hideout, which you could only find access to behind a poster in the Game Corner. The theme of a mafia-like gang making money out of exploiting a gambling establishment and using Pokémon as prizes was a good one, and sneaking into their hideout was all because you poke around where you shouldn’t in the Game Corner, the place of minigames (or minigame). Sadly for the Game Corner, this is the only time it ever had relevance to the plot, save for the remakes in FireRed and LeafGreen. 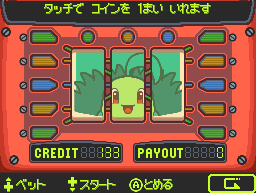 Generation two had two Game Corners, but one was just the same old set of slot machines in Kanto. They had minor changes where for instance a Chansey would show up and help you get triple sevens on rare occasions. There was however an additional card flip game that you could play, although it wasn’t as easy to make a large profit of coins from that game as easily. Again Pokémon and TMs were offered as prizes, while in Crystal the Game Corner was certainly worth your while as a man standing outside would teach you moves like Ice Beam and Flamethrower for coins. It also came with more colours now. Generation three brought its own Game Corner too, and besides minor changes to the slot machines replaced the Card Flip game with one involving a roulette table. Furthermore, Pokémon were no longer prizes, although you could exchange coins for Pokémon dolls for your Secret Base. Meanwhile, there were additional ‘Game Corner’ buildings in Emerald and FireRed/LeafGreen, but these just had a couple of other minigames that didn’t involve any gambling. Lastly came generation four, and Diamond and Pearl were the first games of that set. They brought only the slot machines through, but spruced them up with bonus rounds. If you activated them, you’d end up in a minigame involving Clefairy and pressing the correct buttons in order. This could net you hundreds upon hundreds of coins, provided you could keep it going and that Clefairy didn’t decide to take a rest. It was a nice expansion on the otherwise repetitive slot machine game. But this was the last time that everyone could experience the joys – or tedium – of slot machine minigames. You see, in the following game in Platinum (the ‘third’ and updated version of Diamond and Pearl), most of Europe (sans the UK, in fact) had it cut out. 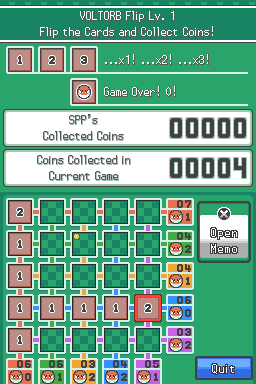 While the likes of Japan, America, Australia and so forth had it run just like before, you’d get a random number of coins when talking to a coin machine instead of a minigame. Nearly all dialogue was also changed for the game too. At least the TM for Explosion which required you to play the minigame was just given out in European games. This just isn’t as fun. But why did it go missing without an in-game word of explanation? 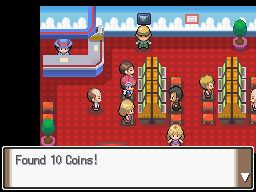 “In Pokémon Platinum Version, the slot machines in the Game Corner cannot be operated by the player, to comply with PEGI age rating guidelines concerning gambling. Players can still get coins to exchange for items, simply by checking the slot machine. PEGI – Pan European Game Information – are the group that decide what games are rated in regards to what age groups they are appropriate for. If they had kept the slot machines in, the recommended age for children to play this game would have skyrocketed from the then standard ‘E for Everyone’, by as much as a rating of ages 12 and up. That would have been one of the last things the Pokémon company would have wanted. Parents not buying games for their kids or stores refusing to sell to too-young customers due to store policies would have resulted in less sales. And that’s ignoring the fact that having the minigame could have broken laws as well, and avoiding unnecessary law suits is in every company’s interests. This would be why they removed the slot machines from Platinum. So essentially, European stigmas against gambling is to blame for the minigame removal. To be fair, the laws do have good intentions behind them, but they do in my opinion go too far as to remove minigames in a Pokémon game. But what about HeartGold and SoulSilver, the games that followed Platinum? These were the remakes of Gold, Silver and Crystal, and as expected they had fancy slot machines too, complete with a Smeargle! What do you mean, you don’t remember this? 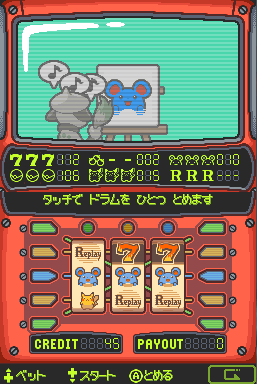 …Well, HGSS really did have slot machines – in Japan. Every other country however had the slot machines removed as well, and replaced with an entirely different minigame called Voltorb Flip. This isn’t a slot machine. You see, during the year separation between Platinum and HGSS, the ESRB – Entertainment Software Rating Board which functions for America and other countries – also toughened up on gambling references within games. It’s not just the European laws to blame here now. Japan had no such restrictions, but everywhere else certainly did. In fact, with Platinum the uncensored version of the game in Australia received a rating of PG rather than E for Everyone, the only mainstream Pokémon game sold there with such a rating. Luckily, they did put more effort in than they did for European’s Platinum. The interior may be redesigned and there may be no slow machines, but a minesweeper style game was put in for our enjoyment which requires a bit more skill than your standard slot machine game. The key point in this game was that you couldn’t actually lose coins, so hence it wasn’t gambling – you either won coins, or you didn’t. This may have been planned in advance too, as data for Voltorb Flip was apparently found in Japanese copies of HGSS. It wasn’t enjoyed by everyone, while others far preferred it to the slot machines. But one could agree that it was still better than no Game Corner at all. Sadly, that is exactly what followed. The fifth generation of Pokémon games lacked in Game Corners. Game Freak must have decided that putting it in for only one country was too much trouble, and such a in-game location unfitting for non-gambling-style games. The fifth generation entries did have minigames however; BW introduced the Dream World which allowed you to play simple flash games on the computer, while B2W2 had Entralink missions which were pretty fun to play. But that was as far as it went. X&Y also followed suit, this time having minigames within Amie but again no Game Corner. Then came ORAS, the latest remakes by Game Freak. But instead of Voltorb Flip, we got a sad owner standing by his inaccessible store, telling us that he had to close his store for ‘reasons he’d rather not talk about’. Poor guy, it’s not his fault the world we live in doesn’t want children ‘gambling’ in Pokémon. That said, it would have been nice if he could have ran some other games at least, instead of giving us the remainder of the Game Corner prizes from RSE – the starter Pokémon dolls for your Secret Base. That’s all he has left, besides the memories. So now you know – the Game Corner is no more, because of anti-gambling laws and video game rating boards enforcing tighter restrictions on gambling references. If DPPt ever get remade, it’s more than likely that it too will suffer the same fate as Mauville’s Game Corner. So keep your original copies if you ever want to see that Clefairy smile fortune down on you and gift you coins. This entry was posted on Sunday, December 14th, 2014 at 2:46 pm	and is filed under Articles. You can follow any responses to this entry through the RSS 2.0 feed. You can leave a response, or trackback from your own site.